The best of home cooking at the North Coast of Ireland. 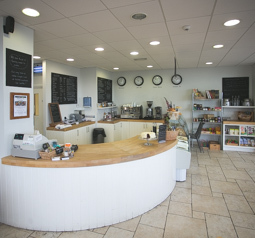 We are very proud to make everything from fresh local produce in our Deli. Whatever it is, we are always happy to help. Just ask. There's nowhere better to enjoy some wonderful home cooked food that at the North Coast of Ireland. We are proud of the fact that we make all our fresh food including scones, cakes, dressings, granola and cooked ham. When you finish eating we would love to you to browse our fantastic range of artisan food products. Oh, we also have the best coffee on the North Coast!